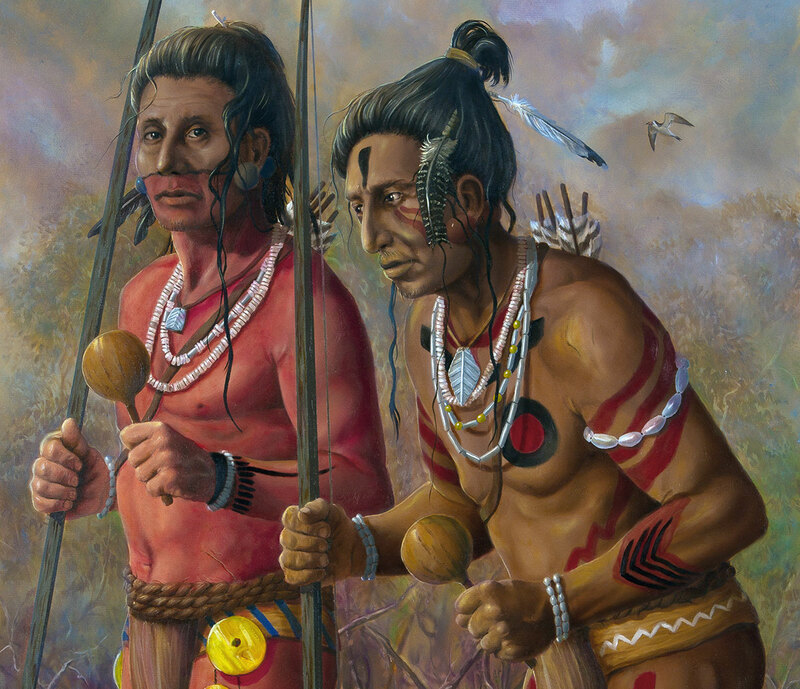 Artist Theodore Morris of Sarasota painted this portrayal of the Ais natives that Jonathan Dickinson encountered in 1696 at Jece, near modern-day Vero Beach. 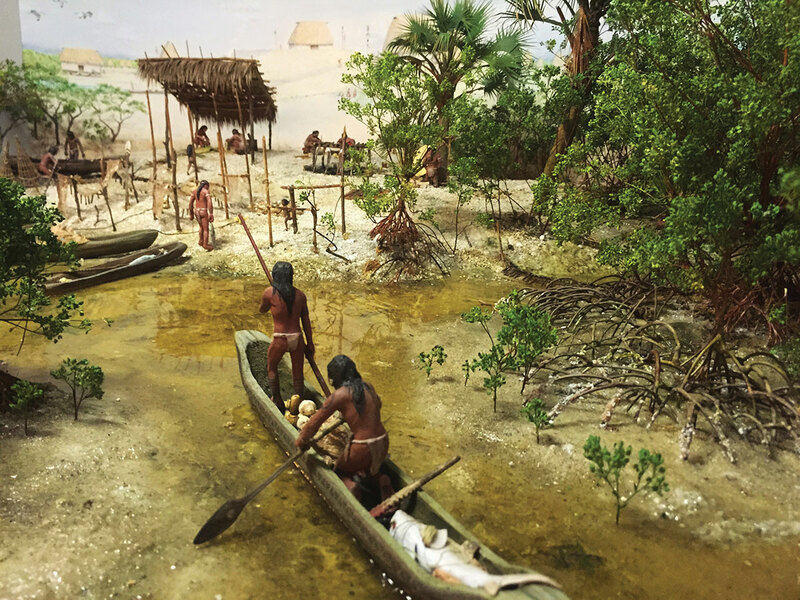 Long before the first people of European origin settled in what is present-day Vero Beach, an ancient people known as the Ais roamed the coast. And, according to the research of two scholars, it was on a large shell midden near what is Pelican Island National Wildlife Sanctuary in Indian River County that the Ais located their capital, known as the paramount town of Jece. The midden, mostly the remains of enormous amounts of shellfish the Ais consumed over centuries, was about 1,000 feet long, 400 feet wide and 40 or 50 feet high. The Ais lived along the 156-mile banks of the Indian River from present-day Cape Canaveral to Stuart, and the midden at Jece was perhaps the highest. Seasonal towns were located along the coast, with the Ais locating their summer towns along the mainland and their winter towns along the barrier islands. The name Ais came from the name of the chief, or cacique, who was referred to as Ais. Thus, Spaniards named the inland waterway the Rio de Ais while the English called it the Indian River. Some historians estimate that the Ais numbered about 20,000 at the time of their first interactions with Europeans, with about 2,000 people living in Jece. The Ais are thought to be the dominant tribe in the area since 2000 B.C. They had their first contact with Europeans — the Spanish — in the 1500s. But it was the Englishman Jonathan Dickinson who provided an expansive account about them in his diary published as Jonathan Dickinson’s Journal. On his way to Philadelphia from Jamaica in 1696, Dickinson and his party were shipwrecked off Jupiter Island. The party was initially detained and robbed by natives known as Jobe near Jupiter Inlet before being released and traveling up to the town of Santa Lucea in modern-day St. Lucie County. From Santa Lucea, they were sent to Jece, where they met the cacique, thought to be the paramount chief of the Ais. They also reunited with survivors of another shipwreck in their party. Although Dickinson did not describe the dress of women and only made a reference to the Ais giving the women in his parties deer hides for shawls, he said the men wore loincloths of woven palm leaves. Dickinson wrote that the Ais did not farm and primarily lived on fish, shellfish, palmetto, cocoplum and sea grape berries. Historians have also concluded that Ais hunted large game, including deer and bears, and fished with hooks made from toe bones of deer they had killed. After several weeks with the Ais, Spanish soldiers eventually arrived in Jece and escorted the shipwrecked parties to St. Augustine, though several people died along the way. From St. Augustine, Dickinson traveled to Charleston, South Carolina, and reached his destination of Philadelphia, where he would become the city’s mayor. The end for the Ais was tragic. Disease, slavery and warfare would lead to the disappearance of their population by 1760. 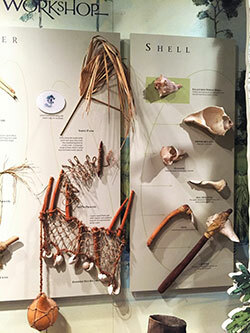 The only monuments to their history were their middens — mounds of oyster shells, burial items and refuse. Early maps referred to the site believed to be Jece as Two Mile Bluff, but it became commonly known as Barker’s Bluff, an apparent erroneous reference to a settler who never lived on it. German-born August Park lived on the midden sometime after 1865. Gottlob Kroegel, who homesteaded property surrounding the hill, and his family began living on the bluff in 1881, with Park purchasing other land in the area. Census records listed just two people living in the area in 1860, growing to five households by 1880. After first living in a palmetto shanty, Kroegel built a large frame house on the mound. The mound contained rich soil, and Kroegel planted beans and other crops as well as one of the first orange groves in the area. Kroegel sold the shell mound to St. Lucie County (of which Barker’s Bluff was then a part — Indian River County hadn’t been created) in 1908. A railroad spur was built to the bluff and shell was carted off to build local roads. 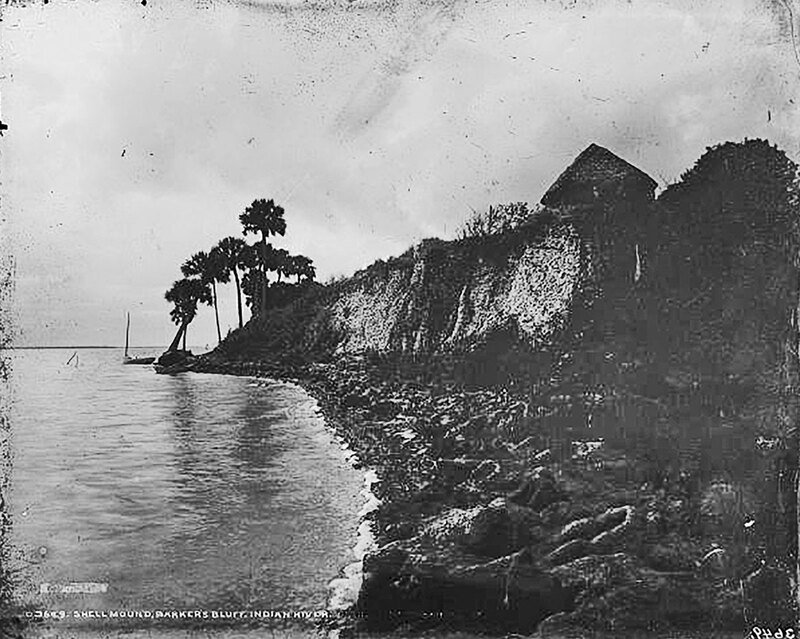 By 1913 the shell mound had been leveled, destroying centuries of Ais history. For years, the paramount town of Jece was thought to be farther south from Barker’s Bluff. But in 2010 researchers Alan Brech and J.F. Lanham concluded in the Florida Anthropologist that the Ais’ paramount town was indeed located at Barker’s Bluff. They based their conclusion on the survey of Alvaro Mexia in the summer of 1605, asserting that earlier locations were based on sightings of an existing inlet instead of an inlet that had closed at Winter Beach after 1715. Sources include Indian River Magazine articles, Jonathan Dickinson’s Journal and One Person Can Make a Difference: A Story of Paul Kroegel and Pelican Island.